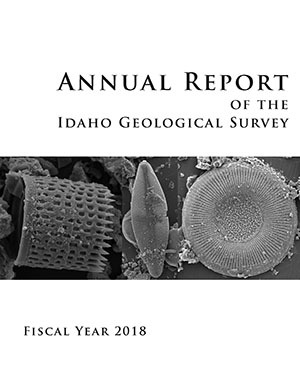 The Idaho Geological Survey (IGS) is a non-regulatory state agency that leads in the collection, interpretation, and dissemination of geologic and mineral data for Idaho. The agency has served the state since 1919 and prior to 1984 was named the Idaho Bureau of Mines and Geology. The Survey’s mission is to provide the state with timely and relevant geologic information. Members of the IGS fulfill this mission through applied geologic research and strong collaborations with federal and state agencies, academia, and the private sector. IGS research focuses on geologic mapping, geologic hazards, hydrogeology, geothermal energy, oil and gas, and metallic and industrial minerals. The Survey's Digital Mapping Laboratory is central to compiling, producing, and delivering new digital geologic maps and publications for the agency. The IGS is also engaged in dissemination of historic mining records, community service, and earth science education. As Idaho grows, demand is increasing for geologic and geospatial information related to energy, mineral, and water resource development, and landslide and earthquake hazards. IGS is committed to the advancement of the geosciences and emphasizes the practical application of geology to benefit society. The Survey seeks to accomplish its responsibilities through service and outreach, research, and education. Idaho Statutes, Title 47, Chapter 2 provides for the creation, purpose, duties, reporting, offices, and Advisory Board of the IGS. The Statutes specify the authority to conduct investigations, establish cooperative projects, and seek research funding. The IGS publishes an Annual Report as required by its enabling act. Exploration Manager, Midas Gold Idaho, Inc.
Idaho Association of Professional Geologists, Idaho Engineering and Geology, Inc. Permitting Manager, Midas Gold Idaho, Inc.
President, Rocky Mountain Environmental Associates, Inc.